So this is my new thing: making cheese. Because I haven't yet invested in things like rennet and cultures, I've been limiting myself to a very simple "lemon cheese" (also called "paneer" in India and "queso fresco" in Mexico). You can also make it with vinegar, if you don't have lemon, though I haven't tried it yet. The cheese is VERY simple and incredibly delicious. Serve this next time you need appetizers for a party and I can assure you, you will wow everyone! Once most of the whey is strained off, gently draw the corners of your cheesecloth/cotton into the center and tie them together with a string. Hang the string from something in your kitchen (I use a kitchen cabinet knob; I've also seen pictures of people using their sink faucet), with the whey bowl underneath to catch the drips. Let your cheese drain 30-60 minutes, depending on whether or not you want a creamier or a dryer texture. (Using my cotton, I let my cheese drain for 60 minutes and it is perfect—creamy and spreadable, but not quite as creamy as, say, cream cheese.) If you are going for crumbly queso fresco to use in Mexican recipes (it's great on top of refried beans! ), let it hang 2 hours. Once the cheese is done draining, gently untie your bundle and scrape the curds into a bowl. At this point, if you want savory/salty cheese, add salt to taste. (Err on the side of too little, as the salt flavor will get stronger as the crystals dissolve and the cheese cures.) You can also add in any other herbs/spices/flavorings that you'd like to at this point. Once everything is mixed in, take the back of a spoon and press the cheese gently into the bottom of the bowl so that it is one cohesive unit, rather than a lot of loose curds. Cover and refrigerate for at least a few hours; the cheese is best the next day, after its flavor has had a little time to mature, but about 3 days down the road it loses flavor. For queso fresco, don't press the curds into the bowl - just stir in the salt and let them remain loose and crumbly. Enjoy! It's SO easy and SO delicious! 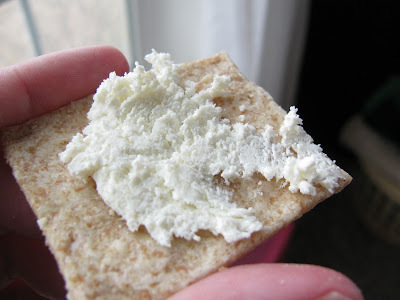 I also think it tastes a little bit like chevre goat cheese, which I love. I can't wait to try it myself! Did you use just regular whole cow milk from the grocery store? 1 quart of whole milk makes about how many ounces of cheese? Geni - yep, just regular grocery store milk! I'd love to make cheese someday with raw milk but for the moment, I'm too poor. I'm not sure how many ounces it made, but if I was guessing I would say somewhere between 1/3-1/2 pound. Definitely a pretty good amount. One day when I have goats, you can come over and get all the fresh, raw milk you want! I will take you up on that! ;) (This is Geni right?) If I live close enough, that is!